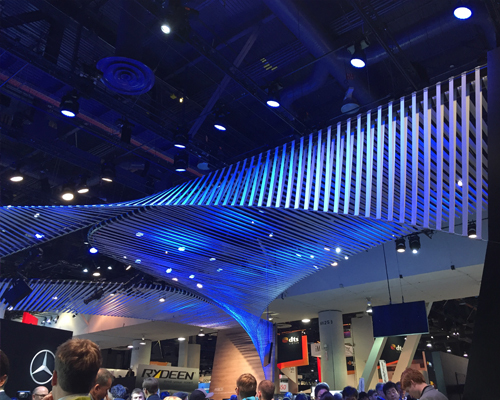 Home / Blog / The Top 6 Trade Show Design Trends at CES to Draw Inspiration From. 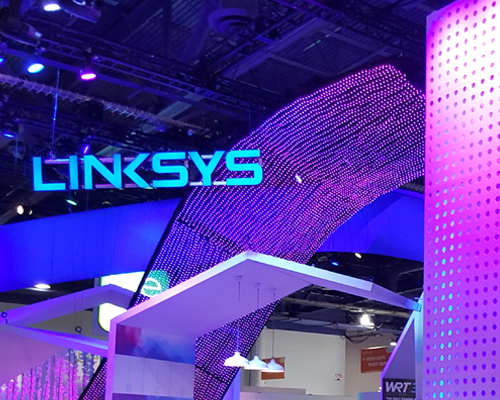 Now that CES 2017 is a few weeks past us, we wanted to reflect on the trends we saw at this year’s show. 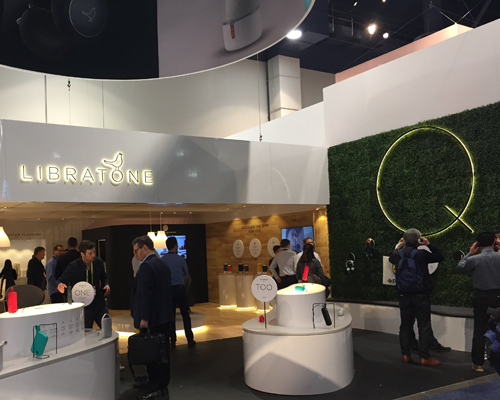 With CES being in its 50th year, exhibitors created a lot of well-designed booths. There was a common thread throughout the show, of trends that were hard to forget. 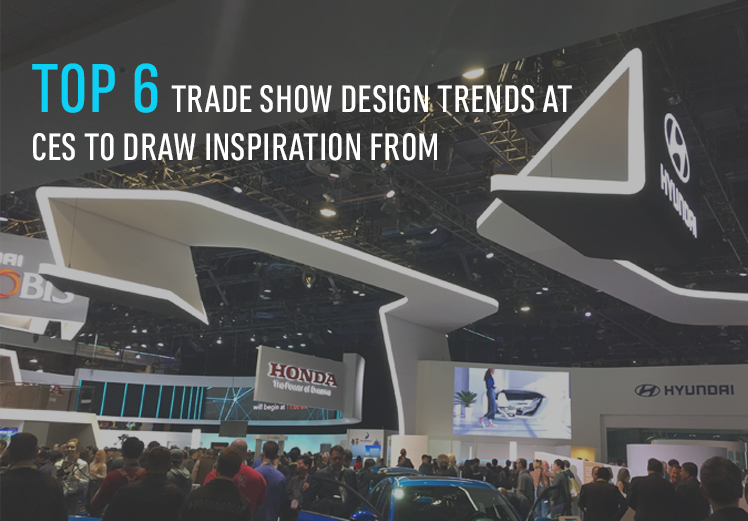 Because CES is one of the first major trade shows to start off the new year, we believe these trends will carry over into 2017. The hanging structures were a show stopper. If you have the budget and want to make a statement, this is the way to do it. 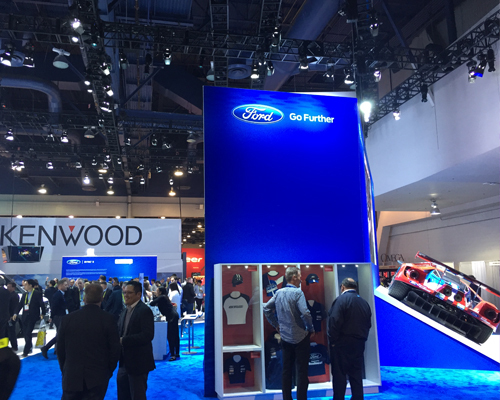 Your booth will definitely get noticed and attendees will go home remembering your booth. Conference rooms don’t have to be a boring white box anymore. 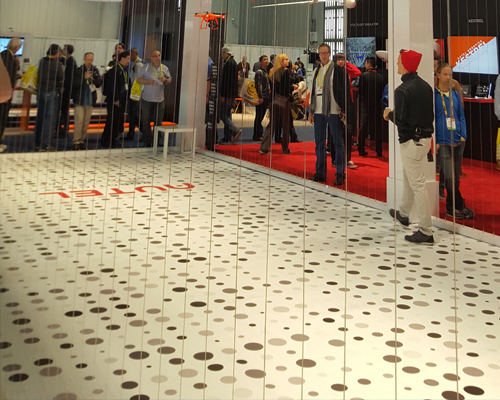 We noticed at CES many exhibitors were going with the concept of having a semi-private or transparent meeting room. By doing this, conference rooms don’t feel closed off anymore. Carrying your design theme into the conference room is a smart design move. You can achieve this look by using glass doors, frosted walls, exposed wood beams, or potted plants. Many booths used different methods to achieve the natural wood look. Be creative when using wood or giving the illusion of wood. Don’t just go for the obvious hardwood flooring. You can use wood in the walls as beams, on counters and shelves, or on a back wall. If you can’t afford to use wood, you can graphic print a wood tone. 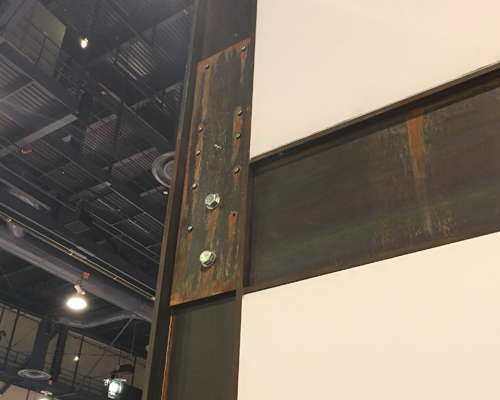 Just like booths using natural textures, industrial textures were a common theme too. 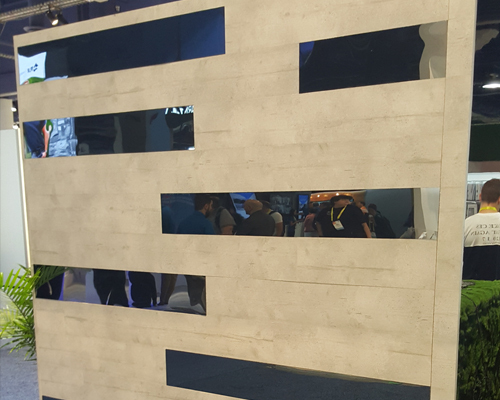 To achieve the industrial look, you can mimic concrete and or metal by graphic printing. 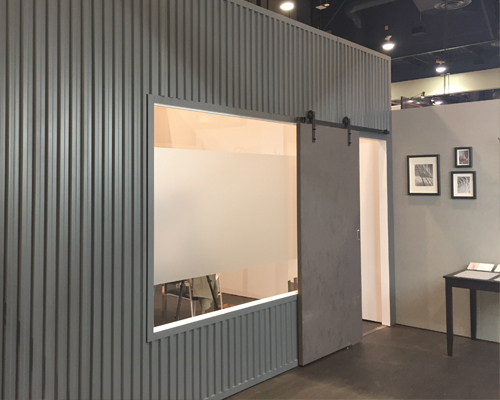 If you want to use the real material, incorporating a metal sliding door is a nice touch, as pictured in the booth below. When natural and industrial themes can be married together in a booth, a rustic/modern theme is beautifully achieved. 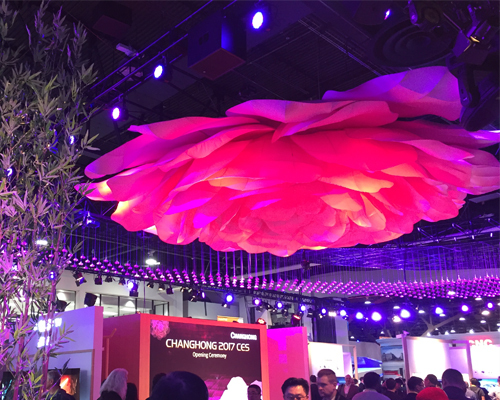 Using lighting in a creative way can do wonders for your booth. If done the right way you can set a specific tone and tell a story through your booth. However, rigging lighting can get very expensive. If you have a bigger budget and you want lighting to be the focal point of your booth you can achieve this look. If you have a smaller budget you can use techniques like using light boxes or matching your carpet color to the lighting color for a bigger impact. 3D lettering is a great way to make your company name and or logo pop. 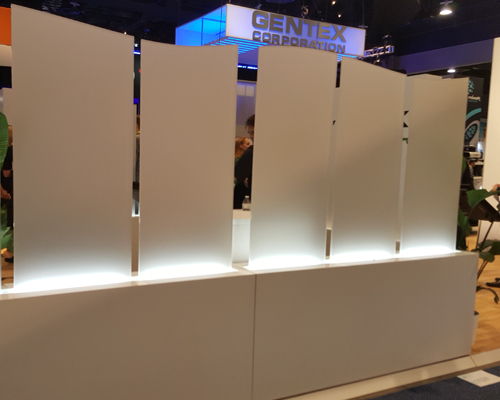 Adding an LED colored light makes your booth stand out even more. 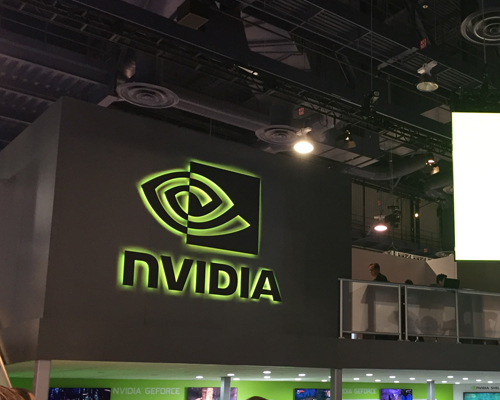 Many booths at CES were using this technique, and the ones that did stood out the most. If your company has brand colors, then use those. If you are going for a more clean and simple look, use a white light, it will still look sophisticated. 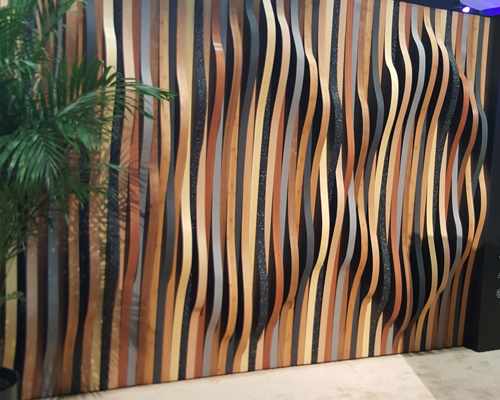 Using a printed pattern for your flooring will help make your booth stand out from others next to you. Another option is to print your company name or logo on the flooring. Using multiple flooring materials in one booth allows you to create multiple spaces in one. 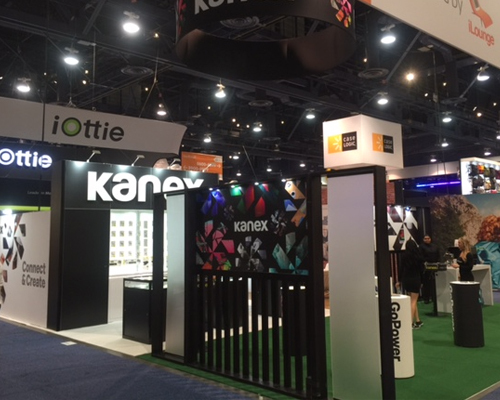 For example, the Kanex booth in the image shown has 3 flooring types in it, turf, carpet, and comfort title. The turf side helps give that section a lifestyle theme, while the carpet section is more of a showcase theme. 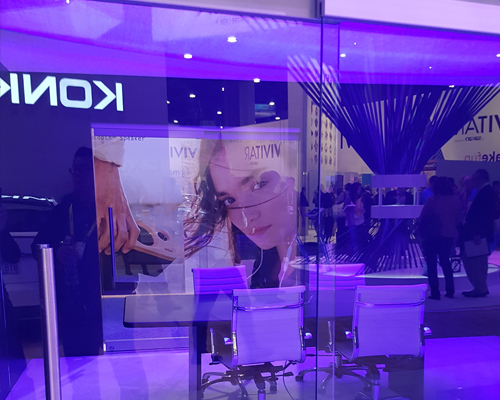 Using one or two of these design techniques will help your booth stand out and attract more potential clients to your business. Kaitlin Reynolds is a Marketing Intern at ExpoMarketing Group. She is currently finishing her final year at Cal State University Fullerton, majoring in business with a concentration in marketing. When she is not busy with work and school she enjoys traveling, snowboarding, scuba diving, reading, and watching movies.